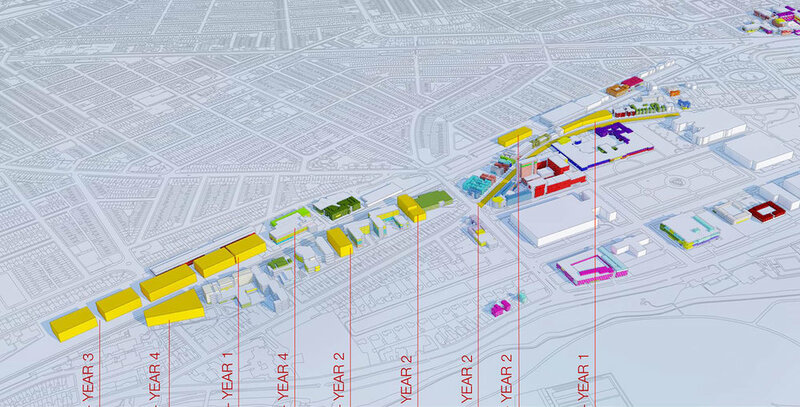 The completed masterplan supports the University’s ‘Way Forward’ document, which sets out the aspiration for the University for the period 2012-2017. MCW reported to the University Oversight Board on a monthly basis. We divided the process into several development periods: preparation; option development; finalisation; documentation, and each element was signed off by the University before the team moved onto the next stage. We undertook extensive consultations with all the senior members of the University as well as all the departments, and our discussions were based on questionnaires that were issued to them ahead of the meetings. The consultation allowed us to visit the departments and to build up a complete picture of issues that were important to the staff and students. We also consulted with a range of external stakeholders including the Local Authority planning department, Network Rail and the NHS Trust at Heath Hospital. We split the masterplan into two main areas of focus. Firstly, we provided a long term vision for the University, which set out the development framework up until 2035. In order to gain a wide agreement we produced a number of development options for each College (the University has three: Arts, Humanities and Social Sciences; Physical Science and Engineering; Biomedical and Life Sciences). These were discussed with senior staff at an awayday in 2014, as well as with the Colleges. A preferred approach was selected at a workshop with the University Executive Board. The long term vision assessed all sites in the area of the University and recommended purchase of several key sites not owned by the University. Once the long term vision was agreed we looked at the Phase 1 Projects, which covered the work required between 2015 and 2025. We constructed a 3D model of the University and local accommodation which was used to enable detailed discussions with the various client groups. At this stage the University Conditions Survey was available, and this, together with the general feedback, was used to target seven key projects. The projects included buildings and infrastructure works. We produced simple massing diagrams to allow the University to understand the scale of the development and we also provided programmes and cash flow forecasts for the project to allow the University to understand the financial implications of the projects.